Frontier dangers cannot hold a candle to the risks one woman takes by falling in love. Tamsen Littlejohn wants nothing more than to escape her cruel stepfather’s clutches and make her own life decisions. When tragedy strikes, Tamsen finally has a choice— accept an arranged marriage or flee her stepfather’s house. Choosing to run, she begins a long trek with the help of frontiersman Jesse Bird, a stranger who selflessly helps her to escape. But her stepfather and would-be fiancé Ambrose Kincaid will stop at nothing to find her and bring her back to her miserable former life. Will Tamsen ever truly escape her pursuers and adapt to a harsh frontier life with the help of the man who is constantly saving her? The Pursuit of Tamsen Littlejohn is a beautifully written historical tale filled with love, hope, and faith. With her detailed descriptions and engaging writing style, Lori Benton truly breathes life into this story. The plot was intriguing, the setting breathtakingly palpable, and the writing is downright riveting. This book had one of the most detailed historical settings I’ve had the pleasure of reading. It literally played out like a movie in my head! The writing is simply magnificent. This is my first book from Lori and it definitely won’t be my last. I really enjoyed the different characters that created diversity within the story. Another great element from the book was the exciting plot that really made me curious about how it was all going to work in the end. One of my absolute favorite things about The Pursuit of Tamsen Littlejohn was that it had unique differentiators from books of this genre with similar plots. I appreciated how it wasn’t just about “a girl who must escape her horrible past is forced to marry a kind handsome stranger” like I’ve read so many times before…it was more than that. It was realistic in a beautiful, honest way. While I was wish I could say I enjoyed every single thing about this book, unfortunately there were some things that kept me from falling in love. The first was that I did not like Tamsen. The main character. I’m not sure exactly what it was that annoyed me so much about her but she never grew on me. This leads to my second misgiving— it took me more than a month to finish this book. And although I was positively impressed with Benton’s richly described setting and beautiful writing, every time I sat to continue the story I just couldn’t read it for long due to my dislike for the main character! I am sure that there’s a lot of readers out there who loved Tamsen, but as for me personally I wasn’t a fan. That was definitely a disappointment considering how many other elements of the story I thought were fantastic. 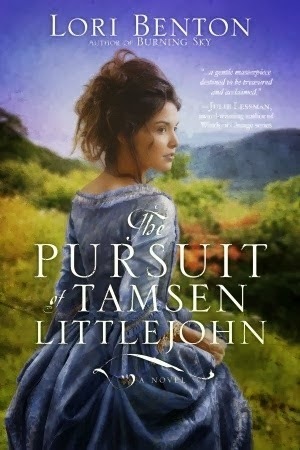 If you enjoy historical and inspirational fiction, then I definitely recommend you check out The Pursuit of Tamsen Littlejohn. It is a beautifully written read that will pull at your heartstrings and have you craving for more from this extremely talented author. I am really looking forward to reading her award winning novel Burning Sky next! **I received this book from Blogging for Books for free in exchange for my honest review. All thoughts are completely my own. I haven’t been able to obtain a copy of this book, but I would like to read it. LOVE the cover, too. Thanks for the review! Hmm… they might still have review copies available on Blogging for Books if you’re interested. I totally agree about the cover– it’s gorgeous!